Solving a genealogical conundrum is always satisfying, and filling in the missing gaps in a family tree is always the dream of a genealogist, particularly if is made more complicated and more difficult due to a gap of centuries. In recent weeks, I have been able to solve one small but curious genealogical riddle in the story of the Comberford family. It involved finding the answer to a question in family history that had remained unanswered for almost 400 years. The story begins with the large family of William Comberford (1551-1625), who inherited the family seats at Comberford Hall, the Moat House in Tamworth and Wednesbury Manor. William was an ambitious man who made the last attempt on the part of the Comberfords to become the principal family in both Tamworth and Wednesbury. When King James I visited Tamworth in 1619, William owned virtually all of Tamworth and the surrounding area, apart from Tamworth Castle. The king stayed at Tamworth Castle on the night of 18 August 1619 as the guest of Sir Humphrey Ferrers, while his son, the future King Charles I, stayed at the Moat House as William Comberford’s guest. During that visit, William converted two rooms on the first floor of the Moat House into one to provide the main entertainment for the Prince of Wales, and decorated the ceiling with elaborate heraldic family trees illustrating the Comberford family tree. William Comberford made his will on 22 June 1625 and died later that year. In his will, he asked to be buried in the north end of the parish church of Tamworth, where he said his father and mother were buried. This is a reference to the Comberford Chapel in Saint Editha’s Church. William Comberford was twice married, and had two large families who were virtually a generation apart in age. He was aged about 16 when he married his first wife Mary, a daughter of his father’s neighbour, William Skeffington of Fisherwick. 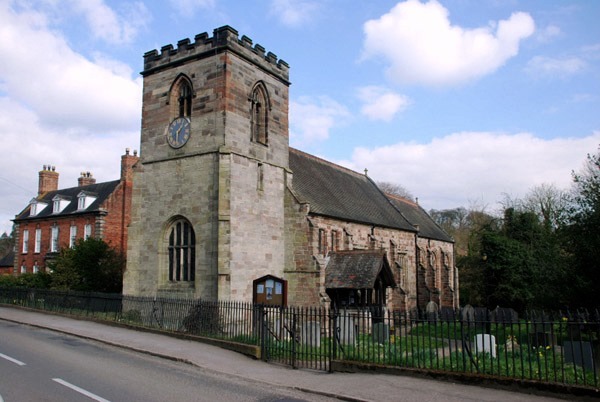 Fisherwick was in Saint Michael’s Parish, Lichfield, and many of the Skeffingtons of Fisherwick, including Mary’s parents, her brothers and her nephew, are buried in Saint Michael’s Church, the same church where the parents of Samuel Johnson are buried. William and Mary Comberford had eight sons and five daughters, many of whom died at birth or in infancy. When Mary died in 1597, she was buried in Wednesbury parish church. After her death, the widowed William Comberford married his second wife, the widowed Anne Spencer (nee Watson), and she was still alive when William made his will in 1625. William and Anne Comberford had nine more children, four sons and five daughters. They included a daughter Dorothy who was baptised in Saint Editha’s, Tamworth, over 400 years ago, on 9 January 1614. An earlier daughter in William’s first marriage had also been named Dorothy and married Walter Coleman. This second Dorothy was a four-year-old when her father entertained the future Charles I at the Moat House. But what happened to this second Dorothy later in life? John F Ede, in his History of Wednesbury (1962), suggests that Dorothy married into the Gilpin family of Wednesbury. Her brother, Colonel William Comberford, had borrowed £1,000 from Gilpin using Wednesbury Manor as security, and £700 of that debt was still outstanding and owing to Dorothy Gilpin after William’s death in 1656. But it is difficult to find any evidence of a Gilpin family connection with the Comberford family, and I could not find any other reason to identify this Dorothy Gilpin and this second Dorothy Comerford. Perhaps I had to look somewhere else to see what had happed to Dorothy Comberford. William and Anne also had a daughter Anne who helped me find clues for my search. This second Anne was baptised in Wednesbury on 8 April 1609, and she is named in her father’s will in 1625. Almost ten years later, in 1634, she married Benjamin Rugeley, a younger brother of Colonel Simon Rugeley, an important leader of the Parliamentarians during the Civil War. Benjamin Rugeley lived at Dunstall in Tatenhill, Staffordshire, between Lichfield and Barton-under-Needwood. He was a younger son of Richard Rugeley (1564-1623) of Shenstone and his wife Mary Rugeley, daughter and co-heir of Thomas Rugeley (1539-1623) of Hawkesyard in Armitage. The Rugeley family was seated at Rugeley, Longdon, Shenstone and Hawkesyard House (later Spode House) in Armitage, near Rugeley in Staffordshire. Benjamin’s father, Richard Rugeley, died in 1623 and was buried in Mavesyn Ridware. Benjamin’s eldest brother, Colonel Simon Rugeley (1598-1666) of Shenstone and Tatenhill, was a member of the parliamentary committee at Stafford; he inherited Hawkesyard but sold it to Sir Richard Skeffington. Their sister Jane married William Littleton (1578-1623) of Pillaton Hall, Penkridge, while another sister Mabel married Thomas Coleman of London. For some intuitive but unexplained reason, I wondered whether Anne’s marriage might provide a clue to the true whereabouts of her sister Dorothy, and I found myself looking at the parish records of Saint Michael and All Angels in Tatenhill. Perhaps it was the genealogist’s hunch. There I found that Dorothy Comberford, daughter of William Comberford, married John Balcanquall on 18 June 1639. But why did she get married in Tatenhill and not in, say, Saint Editha’s Church, Tamworth, or Saint Bartholomew’s Church, Wednesbury? As I pored over those parish records, I found that Dorothy’s father-in-law, the Revd Canon John Balcanquall, was Rector of Tattenhill from 1618. His records show that he was educated at Edinburgh, where he received his MA in 1611. After he moved to England, he received the degree MA at Oxford in 1613 and a BD in 1619, a year after moving to Tattenhill. Later, he became a Canon of Rochester Cathedral (1628) and Vicar of Boxley, Kent (1639). ● 1, Dorothy Balcanquall, baptised in Saint Michael and All Angels, Tatenhill, on 15 April 1640. ● 2, John Balcanquall, born on 13 April 1643, and baptised in Saint Michael and All Angels, Tatenhill, on 30 April 1643. ● 3, Margaret Balcanquall (1644-1644), baptised in Saint Michael and All Angels, Tatenhill, on 29 June 1644, and died 1 October 1644. The name Balcanquall seemed unusual, and I wondered where it came from. It turns out that the name is from Scotland, and derives from lands of the same name in the parish of Strathmiglo, Fife. I checked the registers of the alumni for both Oxford and Cambridge, and found yet another interesting story. The Revd John Balcanquall and his brother, the Revd Walter Balcanquall, began their lives as Scottish clergymen, the sons of the Rev Walter Balcanquhall. But they moved to England and became staunch royalists and supporters of the church policy of King Charles I. The younger Walter Balcanquall was born in Edinburgh ca 1586. He studied at the University of Edinburgh intending to seek ordination in the Church of England, and he graduated MA in 1609. But he then moved south to England, and entered at Pembroke College, Cambridge. There he received his BD, and he became a Fellow in 1611. Walter was appointed one of James I’s chaplains, and in 1617 he was appointed Master of the Savoy, London. In 1618, James I sent him to the Synod of Dort as a delegate from the Church of Scotland. That year, the University of Oxford conferred with the degree DD. In March 1624, Walter was appointed Dean of Rochester Cathedral. In 1638 he revisited Scotland, as chaplain to the Marquis of Hamilton, the royal commissioner, but was very badly received. A year later, he became Dean of Durham Cathedral in 1639. On 29 July 1641, Walter and his family were denounced by the Scottish Parliament as “incendiaries.” He retreated to Oxford, where he shared the waning fortunes of Charles I. He died at Chirk Castle, Denbighshire, on Christmas Day 1645. I have yet to find out when Dorothy’s father-in-law and Walter’s brother, Canon John Balcanquall, died. But he too seems to have suffered in the English Civil War, and the parish of Tatenhill was vacant at the Restoration in 1660. The sandstone Parish Church of Saint Michael and All Angels is a 13th-century building and was substantially enlarged and altered in the 1400s. Around 1890, the Gothic Revival architect, George F Bodley (1827-1907) restored the parish church, and it is now a Grade II* listed building. Beside the church is the Old Rectory, but this is later than Canon John Balcanquall’s time. It was built in the early 1700s for the Very Revd William Binckes, Dean of Lichfield. The rectory is noted for its fine Georgian architecture and is also a Grade II* listed building. In 2008, the rectory was one of four finalists in the contest for “England’s Finest Parsonage” in Country Life magazine. I had found the answer to another family riddle, almost 400 years on in time, and I had closed another gap in the family story.